Very high quality colour detail for the Forward Equipment Bays. 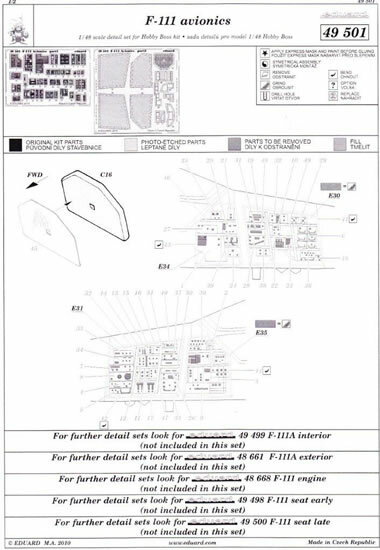 During my time on F-111s, one thing that we always made sure of was to ensure no photos were taken of the aircraft with the Forward Equipment Bays (FEB) open, hence a quick search turned up a only few older images. 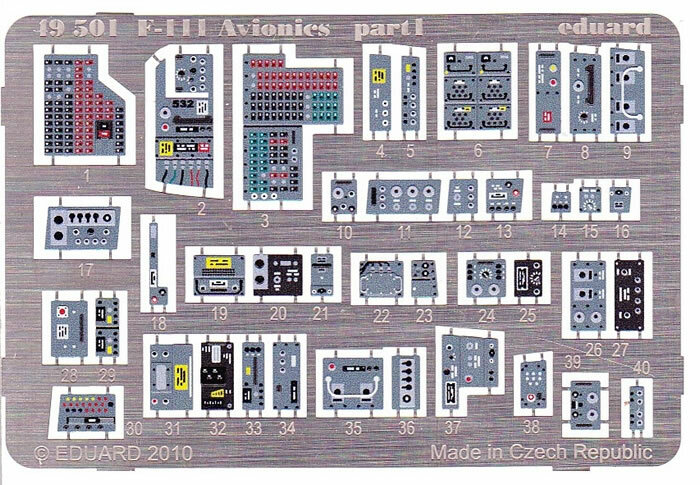 Now this set does not say what model F-111 or what era, not a problem, as given there are not too many references readily available, the only people who may argue accuracy are those who had a close association with the aircraft. I have built the Hobby Boss F-111C, and even made an attempted to add all the wiring harnesses and then do a ½ decent paint job. Needless to say my Forward equipment bays are closed as I was not happy with the painting detail that I could achieve. When I saw these I thought wow, they are a very close representation of the various components fitted to the FEB, and the circuit breaker panels are very nicely done indeed. You will need to remove the surface detail from the kit plastic, paint then add the PE, if you were to add some wiring I feel the overall look will be amazing. The plain PE adds additional detail to the bays and has a PE part for the radar, which looks nothing like the F-111 radar I knew. Overall a great addition to the Hobby Boss kit that will make the FEB look great.